Over the past few years, I’ve mentioned countless times that we really need an SRS system to make studying Japanese grammar more convenient. Something like WaniKani but for grammar instead of Kanji. 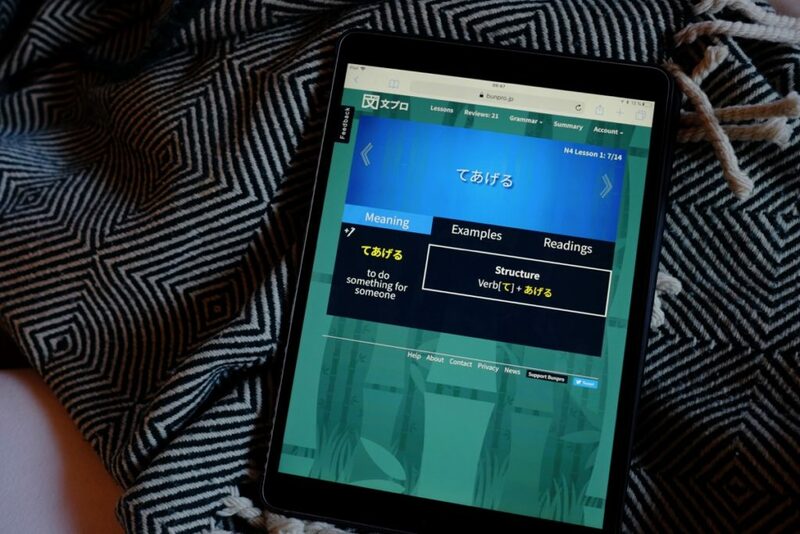 I was always eagerly awaiting EtoEto the revamped version of Textfugu which wasn’t bad in its days but just lacks content above the very beginner stages. EtoEto still isn’t publicly released (there is a beta though) but we got something else from the WK community: Meet Bunpro the first SRS program for Japanese grammar. 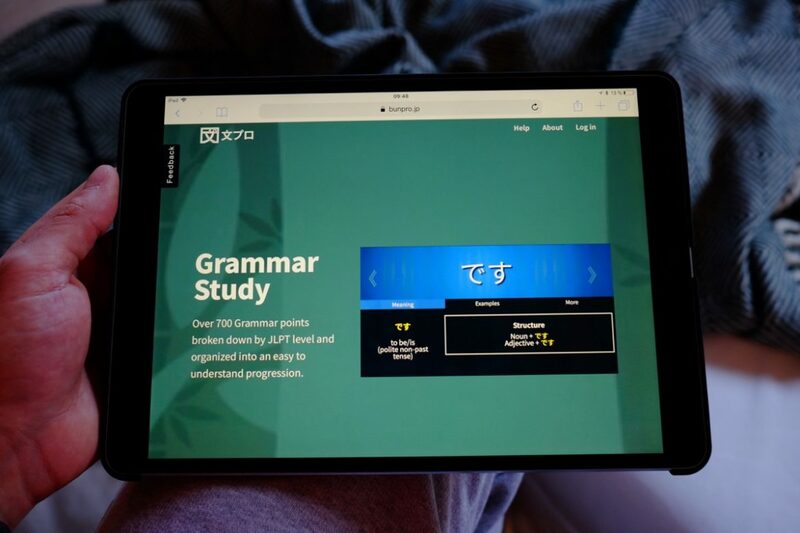 It’s free (you can donate to support the development) sorts grammar points after JLPT level and the SRS system works like a charm. The best thing for me though: You can study wherever you are and just need your phone or tablet. 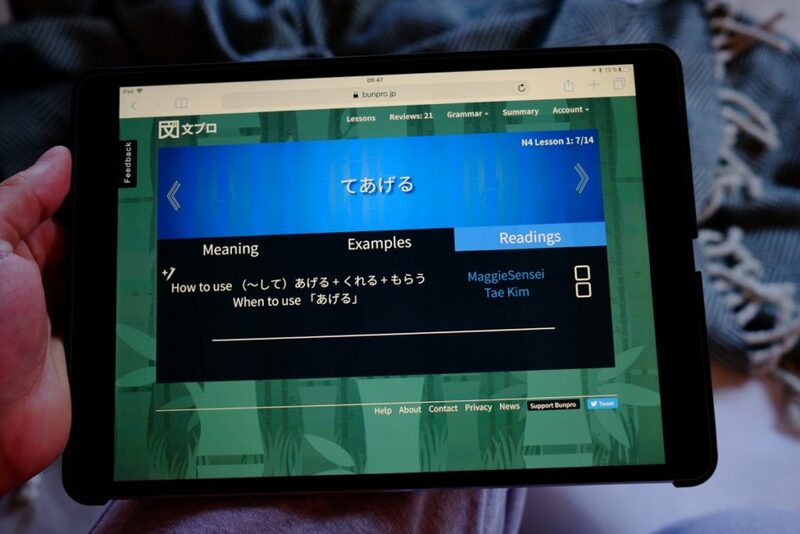 I know this was possible before with the countless sites focused on Japanese grammar but Bunpro tells you exactly what to study (mighty SRS) and gives you the convenience to have everything in one place. The biggest obstacle to overcome when studying: Not really knowing what to do next. Apart from staying motivated this is the reason why so many people (including me) lose track of their study goals. And that’s the reason why WaniKani and iKnow work so well. You always know exactly what to do next to get one step closer towards your goal. Like I already mentioned Bunpro is teaching you every grammar point you need in order to pass JLPTN5 to N1 or rather that’s the ultimate idea. Right now you have access to nearly everything excluding N1. 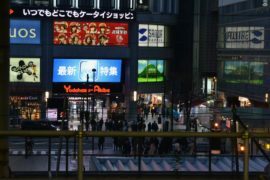 I don’t really know how many grammar points are exactly included in each JLPT section but be reassured that you will be quite busy for a while with the content already provided. More are added on regular basis as well as constant improvements to the overall look and feel of the site. Each JLPT level is sorted into 10 packs which contain various amounts of grammar points. Each item presents you the essence and constructions on how to use it together with a couple of example sentences. The last entry called “reading” gives you a couple of links to third party sites (usually Tae Kim, Maggie Sensei etc.) which also cover that grammar point you’re learning. If you check the boxes after each link the item will be moved to your study queue and the magic of SRS begins. Everything is one place grammar-wise. The gist of the content, external links and you can even take your own notes (which I do pretty often as of late). I’m using Bunpro for a couple of weeks now and it’s just great to cram in a little grammar study here and there. The SRS system intervals are a little too tight for my taste. You really have to answer an item right a couple of times until you won’t see it for 2/4 days. Maybe it’s more practical this way for grammar but otherwise, I would prefer the more stretched out SRS intervals you’re used to by WaniKani. If I’m correct a feature to adjust the times to your own liking is already in the making. There are weeks where I would never have the calm to just sit down and study a little grammar with a textbook. But Bunpro is different. You can just pick it up go through your study queue and be done with it. Wherever you are. You don’t have to memorize where you left off or read walls of text. Just go through your study queue and whenever you feel like it, you can add some more grammar points to study. On a textbook note: I just received とびら, a textbook for intermediate students, in the mail. Its sort of the logical continuation from Genki but I read that it’s a pretty big step up in difficulty. I just had a little glimpse inside and the whole structure already looks a lot like Genki (which is great because it’s an awesome textbook). But more about Tobira with another post when I had the time properly work with it. Let me know your thoughts about Bunpro. Are you already using it or did you just start? You can already feel the whole Christmas vibe and I have prepared accordingly. Tobira is on the way (wanted to pick this one up for ages) and I can’t wait to dive right into it these holidays. It’s been a while since I last used a textbook. My Dentistry studies currently take most of my time and the weekends are crammed with studying for tests or working in the lab. I always try to squeeze in some more Japanese into my life. Watched Terrace House (which is awesome and highly recommended btw), still searching for a nice Japanese blog about video games and probably just downloading THAT Senran Kagura game for the Switch. You know, to try out the tech. If you have any recommendations for Twitter/Instagram accounts to follow, podcasts to listen to or Blogs to read. Please share them! I’m always more than grateful. 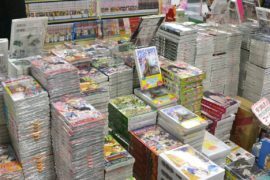 Can you learn Japanese from Anime?